We have been blessed with many outstanding rookie seasons throughout the history of baseball, especially in recent decades. Ichiro Suzuki crossed the Pacific and instantly turned into a super star. Mike Trout, well, he did Mike Trout things. We’ve seen Mike Piazza, Britt Burns, and Troy Tulowitzki all put up 7 WAR rookie campaigns. Each of these stories are amazing in their own right, but they are all about guys with truly phenomenal rookie seasons. Emphasis on season. Gary Sanchez, well, he was just a little bit different. Gary Sanchez put up similar power numbers to a lot of those guys I just mentioned, he hit 20 home runs and 12 doubles, not too shabby for a rookie. That isn’t the story here, of course. No, he did this all in less than half a season, 229 plate appearances. Closer to a third of a season, really, and in that time he put up over 3 WAR and made a strong case for the league ROY (and MVP, which lead to many silly arguments). Wait a sec, I think I skimmed over that a little too quickly: Twenty home runs in 229 plate appearances?! That is crazy, simply crazy, and it makes analyzing his potential all that more difficult going into 2017. Is he a 40 home run guy? Is he a 20 home run guy? He hit 11 home runs in the month of August, how can anyone suggest he *only* has 20 home run power? Eleven in a month? Even if you cut that by 2/3 you’re still talking about 25 home runs on the season. How about that batting average, though? He hit .282 in AAA and .299 in the majors. Clearly, if you have a catcher who can hit 25-40 home runs while also batting .280-.300, he’s probably going to wind up being one of the most valuable guys in fantasy baseball. On the flip side, that seems impossibly optimistic, so where could he land in real life? Well, I have gone through his contemporary comps and I think I’ve settled on a realistic outlook. Sanchez posted these extreme power numbers while riding impressive Exit Velocities. Just how impressive? Well, I’ve created a few comps using rolling averages over the course of the past two seasons. These averages only count balls in play that have a measured exit velocity. While the labels are a bit different from chart to chart, they are all on the same horizontal scale in all cases, and in the three overlays they are also on the same vertical scale, which represents frequency. Obviously, Gary Sanchez has far fewer plate appearances, so his frequencies are a bit dwarfed by the others here. The height of the the bars isn’t particularly important, though. We’re more interested in the general pattern that emerges, and the maximum velocities he can sustain over these 20 BIP windows. Each player has a different peak exit velocity, and while these four guys seem pretty similar, keep in mind the vast majority of players have much lower exit velocities. Even great hitters like Buster Posey just about max out around 93 mph, meaning only a tiny fraction of the bars to right of the 93 marker in these charts (8% in Posey’s case). I mean, just look at the charts. Look at where that 93 marker is. Keep that in mind, these guys are elite. Stanton appears to be on another level, though, and isn’t necessarily a great comp for Sanchez. I threw him in just to show a bit of perspective. There are always bigger fish. (Stanton’s numbers go off the chart, these max out at 105mph, but he keeps on going up through 106 and beyond, these are 20 BIP averages!). To my eyes, he appears to match up closely with Cespedes in terms of these exit velocity numbers. You’ll see that each of these guys have bi or tri-modal distributions. I’m not sure exactly what causes this, but I have a feeling it may be increases in line drive rates. The third, mode, perhaps, may be the result of an uptick in ground balls. Gary Sanchez hasn’t had enough time to truly differentiate these modes, but perhaps you can see the beginnings of his second peak around 91mph, which is very similar to Cespedes. This table is a bit more detailed, and you can sort the columns to play around with the data a little. These are just a few guys who seem to be most closely related to Sanchez in terms of these batted ball stats. 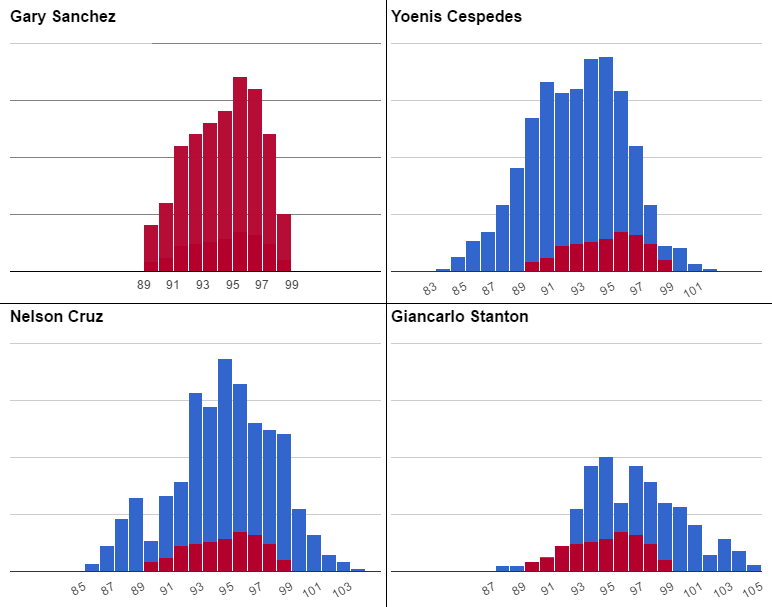 Cespedes and Cruz appear to be the closest matches, with similar vertical and horizontal angles along with similar exit velocities to Gary Sanchez. You’ll see Sanchez has the lowest fly ball rate of the bunch, which is probably a result of sample size. As expressed in the histograms above, you’ll expect at least one more mode along the distribution of hits, it will almost certainly be below the current maximum, and probably somewhere close to 91 to 93 mph. His fly ball exit velocity, which is currently sitting around 97mph, will almost certainly drop and converge on this lower number. So, what exactly will that mean, in the long run? Well, balls hit between 87 and 93 mph have a batting average of .252 and a slugging of .323. Cespedes and Cruz had 52 and 55 percent of their rolling averages in this exit velocity range, whereas Gary Sanchez had 30 percent. I went back and selected a random sampling of balls hit by Cespedes in this velocity range over the past two years, 105 in all, to bring Gary Sanchez up into that similar range, so he would have the same proportion of low and high exit velocity balls as Cruz and Cespedes. All of this amounts to a back of the envelope calculation. However, it isn’t very far off from his ZiPS projection. Each of these systems pose similar batting averages, but they differ on slugging, particularly home run power. Which is more accurate? I’m not sure. In 2016, xStats gave him 17 xHR, and he hit 20. Perhaps that is a weakness in the system or improperly tuned park factors. Perhaps he got lucky on a few balls that left the park. Either way, that difference may bridge the gap between the power numbers. We hoped you liked reading What To Expect From Gary Sanchez In 2017 by Andrew Perpetua! Andrew Perpetua is the creator of CitiFieldHR.com and xStats.org, and plays around with Statcast data for fun. Follow him on Twitter @AndrewPerpetua. From video I’ve seen of his HR’s he looks like a low ball hitter. So, of course, I expect him to be challenged up in the zone. Did he show any ability to adjust over time last season? I took a peak at his heatmap, and I don’t see him having a low ball tendency. He has some weakness up and in (who doesn’t? ), but for the most part it seems like he killed just about everything.